: The 2018 Sheenazing Awards - Nominations are CLOSED! The 2018 Sheenazing Awards - Nominations are CLOSED! 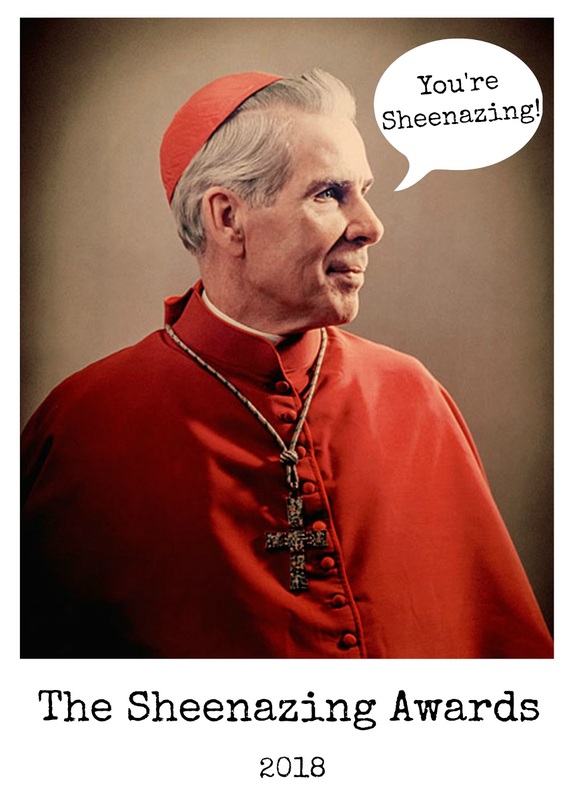 The Sheenazing Awards are named for Venerable Fulton J. Sheen and are my attempt at honoring one of my favorite saints while recognizing the time, talent, and hard work that so many put in to building up the Kingdom of God through new media. The nominees will receive the knowledge that they are appreciated (and will hopefully gain some new followers, too!) The winners all receive a congratulatory email and a virtual handshake from me. What more could you want?! 3 - You can nominate up to two (2) blogs / social media accounts in each category but you don't have to nominate any if you are unfamiliar with a certain category. 4 - You can nominate yourself - no one but you and God will know. I'll gather nominations through Saturday, July 21st. I will then contact the nominees and official voting will begin on Friday, the 27th, unless something happens in my life and I cannot keep to this timeline. Because this isn't the Grammys or Oscars or even the Fisher's Net Awards. This is a mommy blogger standing at her kitchen counter during nap time. Sorry, nominations are now closed. Check back soon for voting! *A brief review of all nominated blogs is done to make sure they fulfill the first rule and are run by Catholics who are faithful to the teachings of the Catholic Church and believe that Pope Francis is the true pope. If I missed something please email me with your concern. That is for doing this again bonnie!! Always so fun!! Of course! I enjoy it and I'm glad others do too! I would like to nomine Coffee and Pearl. Please click on the linked words "now go nominate your favorites" above! Thanks! I would also like to nominate Coffee and Pearls with Sterling Jaqith and am not sure if this is the right place to communicate my intention. Hi Cheryl! You can click on the linked words "now go nominate your favorites" above and that will take you to a Google Form where you can nominate Coffee and Pearls! Thanks so much! I would like to suggest cage matches in the event of a tie. Or, thumb wrestling if we're concerned about things getting immodest ...though I can be ready in full pantaloons at a moments notice. "This is a mommy blogger standing at her kitchen counter during nap time. "<---I think this one sentence so perfectly captures the essence of what life looks like for many moms who blog now, I love it! Yes, I really think it does! Or at least me!